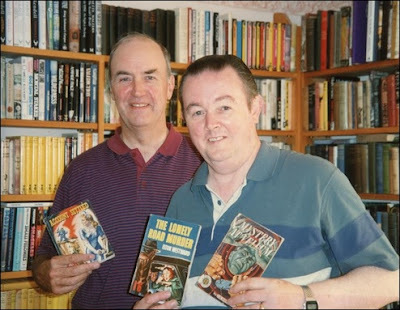 On the last day of November, I hosted a guest-blog by Philip Harbottle, titled "The Detective Fiction of John Russell Fearn," which detailed his untiring, decades-long trek that lead to the republication of Fearn's entire body of work and recommended eleven of his detective novels – two of his recommendations specifically caught my fancy. I've already reviewed Pattern of Murder (2006) and was not letdown by either the authenticity of the cinema setting or the quality of the plot. The second title that caught my eye was Account Settled (1949), because yours truly is a predictable hack of the first water who has already tagged close to 350 blog-posts with the "locked room" toe-tag. What about The Man Who Was Not (2005), you ask? A story that "positively bristled" with impossible crime material and comes across as S.S. van Dine's The Greene Murder Case (1928) as perceived by Paul Halter. Don't worry, I already added that one to the pile and will be covered in a future review. 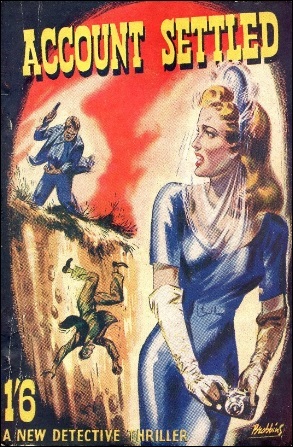 Account Settled is without doubt one of Fearn's pulpier crime stories, but without the plot dissolving into hackery as was, sadly, the case with Robbery Without Violence (1957). The tale is a diverting and highly readable potboiler bubbling over with cut-throat business practices, betrayal, brutal reprisals and a number of inexplicable murders. However, it takes two-thirds of the book to get those impossible crimes and they only play a minor part in the overall plot. So keep that in mind when you decide to dip into this one. Rajek Quinton had been "a master-watchmaker since the age of twenty" and left his native country of Switzerland behind in order to sell his world-altering invention in the United Kingdom. Quinton has found "a way to make matter pass through matter" by forcing "the atoms to obey magnetism," which neutralizes their "normal obstructive power" and designed a "self-sinking atomic bomb" – which means that the bomb can "go anywhere, through anything, and remain hidden." Until the time-fuse fires it. A terrifying weapon that could bring any country in the world "to its knees in twenty-four hours." Quinton had attempted to contact the War Office, but there was such a delay that he decided to make an offer to a well-known financier, Emerson Drew, who stands at the head of the Drew Financial Trust. Drew is definitely interested in this "colossal invention" and exchanges a signed receipt for the blueprints, which he wants to have looked over by the head of his own scientific research department, Bruce Valant. And Valant doesn't need much time to confirm Quinton's claims. Drew is not only the head of a mighty finance company, but also the leader of a small, shadowy cabal of tycoons who have no qualms when it comes to, as they call it, "a necessary extermination." This tiny, tight-knit, group of industrial moguls consists of the financier himself, Joseph K. Darnhome of Darnhome Metals Corporation and Marvin de Brock of Independent Atomics. Drew's private chauffeur, Douglas Brant, is employed to do the dirty work and is ordered to take Quinton out of the picture and ensure his body is never found or identified – leading to a gruesome attempt on the watchmaker's life. Brant disfigured Quinton's face with nitric acid and pushed him into a quagmire at the bottom of an abandoned mine-shaft. However, Quinton is not dead and he will come back to haunt all of them. And in the meantime, their assumed murder has kicked up more dust then the group had intended to happen. Quinton has a sick daughter, Jaline Quinton, who comes to Drew's office to ask what happened to her father and she finds an unexpected ally in Drew's private-secretary, Janet Kayne. Together they go to Scotland Yard and speak with Chief Inspector Poole (the same Poole as Henry Wade's series-detective? I like to think so! ), but talking to the Yard turns out to have deadly consequences. Miss Quinton vanishes and Drew orders Brant to remove Kayne from this plane of existence, but then the disfigured Quinton returns from the dead and takes out Brant. These deaths leaves Drew with two vacancies in his personal staff, which are filled by Joyce Sutton, who bears an uncanny resemblance to the missing Jaline Quinton, and a man by the name of Peter Maxton – who's actually Larry Clarke of the Special Branch of the Metropolitan Police. Clarke and Sutton begin to work together in an attempt to gather evidence against the three men. They try to accomplish this by installing a spy-window, using the then brand new "X-ray glass" (polarized one-way glass), in Drew's private-office. Where the story becomes really interesting is when Quinton lures Drew, Darnhome, De Brock and Valant to a remote house he has converted into a giant death trap for the purpose of extracting his revenge. The doors in the house are electrically sealed. The windows are blocked with steel shutters and even the walls and floor are steel-lined. So the place pretty much resembles "a steel box." After they dined in the strange house, they find a note by Quinton stating that it's his "avowed intention" to destroy all of them, "one by one," which makes for a situation that strongly reminded me of Gwen Bristow and Bruce Manning's The Invisible Host (1930). 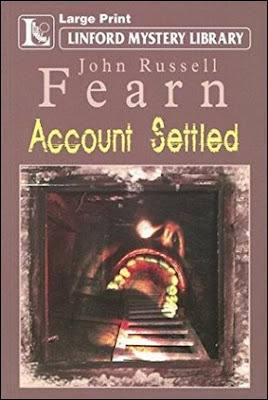 I would not all be surprised if Fearn had Bristow and Manning in mind when he wrote the last portion of Account Settled, because the way in which Quinton deals out death is very reminiscent to the many murders in The Invisible Host. Anyway, two of the murders are of the impossible variety: one of them has "a dagger buried to the hilt between his shoulder blades" in a gloomy, dimly-lighted, but deserted, hallway bare of any hiding places. So nobody appears to have been in a position to deliver the fatal dagger thrust. Another member of the party is found strangled to death behind the locked door of a bedroom. As said previously, these two impossible murders only form a minor part of the overall plot and were quickly dispelled. The death in the locked bedroom is almost immediately solved. Nevertheless, you have to admire Fearn for waving away the "hoary, hackneyed melodrama" of hidden panels and secret passageways. The explanations are without question pure, undiluted pulp, but perfectly acceptable within the confines of this particular story. I also want to add that this is what, more or less, I had hoped to find when I cracked open Kate Wilhem's Smart House (1989). Fearn succeeded, where Wilhem failed, without the use of (somewhat) modern computers! Naturally, the danger infested house also provides an exciting ending for the two innocent characters, Clarke and Sutton, who were caught in between Quinton's desire for revenge and his victims. 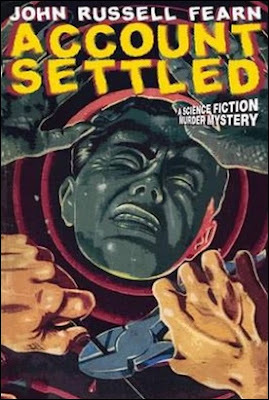 On a whole, Account Settled is a diverting pulp-thriller with an and-then-there-were-none ending that included two fairly original impossible crimes, which makes for a great tag-along read. Yes, this is a book that you should read without your deerstalker on, because there's nothing here for the ardent armchair detective to solve. You just have to sit back and read how a group particularly nasty, high-class criminals get their long deserved comeuppance. Lastly, I promised a little surprise earlier in this post concerning the meeting between Adey and Harbottle.